Sixteen-year old Selena Fallon is a dreamer. Not a day-dreamer, but an I-see-the-future kind of dreamer. Normally this is not a problem as she has gotten pretty good at keeping her weird card hidden from everyone in her small town. Except from her best friend Kyle and her grandparents, of course. But when Selena dreams of her own rather bloody death, things get a little too freaky even for her. Enter Dillan Sloan. Selena has seen the new guy in a different dream, and he is even more droolworthy in person. Beyond the peircing blue eyes and tossled dark hair, there is something else that draws her to him. Something…electric. Unfortunately, Dillan makes it more than clear that he does not feel the same. They just met, so why would he act like he hates her? When Dillan and Selena are forced together one weekend to work on a school project, Selena prepares to be ignored as usual. But when she stumbles across a few undead in the backyard, Dillan comes to her rescue and reveals a whole lot more. Not only is he part of a society that hunts otherworldly creatures…she is too. And she is being targeted by a force bigger and darker than anything she ever imagined. 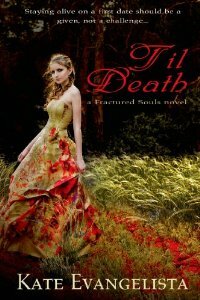 Despite her death dream, Selena is not going to give up easy, especially when she discovers that Dillan might not actually hate her after all. What do you think? Isn't the cover gorgeous?